Play as a space beetle, kill a big head. Phil couldn't have made rhythm action game Thumper sound less appealing to me when he described it (positively) as a "simulated panic attack", but I am curious to see what that means. We already knew that developer Marc Flury's 'rhythm violence' game would be out in October, but as October is finally here, perhaps it's time for a reminder: Thumper releases on October 13. Hey, that's next week! Next Thursday, to be precise. For now, Thumper has gone 'gold', and I mean that literally: its logo has gone gold for this announcement tweet. 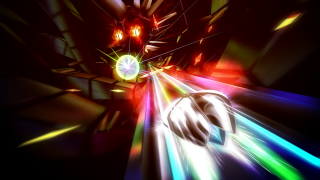 Reminder: Thumper has you playing as a shiny space beetle, hurtling across the void in norm-o-vision or (on PlayStation) VR. "Brave the hellish void and confront a maniacal giant head from the future," is basically the whole premise, and yep, that does it for me.